​Good Saturday morning Soul friends! Join me 'On The Porch' for a cup of coffee? Let’s grab our Bibles and we'll just sit for awhile being still in God's glorious presence. ​Being still -- what a challenge for us today with our hurried schedules and responsibilities. But Oswald Chambers reminds us: 'The busyness of things obscures our concentration on God." We have so many people and responsibilities, appointments and duties, jobs and to-do lists vying for our time. With our attention scattered in so many different directions and on so many things, it can be difficult to slow down enough to focus on God. 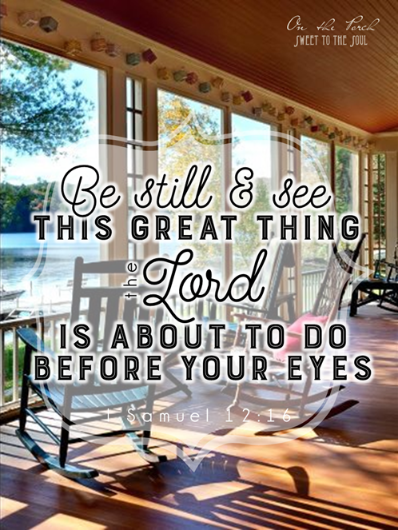 ​"Now then, stand still and see this great thing the LORD is about to do before your eyes!" I love this Scripture today... God is directly telling us "Hey! Pay attention! I'm doing something here!" Just as Samuel was telling the people. They had lost their focus on God and were placing their faith in material things, even to the extent of making them little gods. Samuel had prayed and God was about to show himself in a mighty miraculous way – stormy thunderous rain. Miraculous because it was out of season, without any appearance of rain occurring naturally and on God's command. Isn’t this how God gets our attention sometimes? Everything is going well, smoothly, favorably; and we began to take our focus off of God and onto other things, our little gods. We can begin to take credit for what God has sent as blessings – good will, job promotion, financial stability, bright open clear skies. We can become enamored with people in our lives, listening more to our pastor or Bible teachers, depending on them for spiritual nourishment instead of going directly to the source, God. We can become reliant on things for spiritual, emotional or physical fulfillment; being more consumed with the short term gratification brought by temporal things instead of focusing on the eternal riches of heaven. When this happens, often God has to do something large to get our attention refocused; just as He was about to do here for the people of Israel. Something totally unexpected was about to rain down on them, literally - a miracle, and the pure effect of His almighty power. God is raining miracles - are we paying attention? Reading this today makes me wonder just how many times God has rained down a miracle in my life and I was too busy otherwise to even notice. The practice of being still in My presence is almost a lost art, yet it is this very stillness that enables you to experience My eternal love. You need the certainty of My loving presence in order to weather the storms of life. I would love to hear from you... how do you "be still" in His presence? Join the conversation in the comments below. A year ago today God grasped my attention to be still and to refocus on Him by literally taking my feet out from under me. I had a fall and a fractured hip that stopped me in my tracks. The time spent in the 5 month recovery time has prepared me and my family for the events that have occurred since.How thankful I am for that fateful Friday early morning.I have learnt the priceless treasure of " Be still and Know that I am God". Ahhh, stillness! God has been teaching me this VERY thing for the past year. How wonderful it feels to just rest in His presence, yet I let myself get pulled away into busyness so often! A beautiful reminder today, soul friend!